We’re back, in one piece, minus one piece of luggage (which we are assured will be returned to us this evening…). Italy is a memory, but a bright, life-sized one that I’ll hold in my heart until I’m gone. And while Italy itself is a gorgeous country filled with color, music, light and flavor, it was the joy of being a family that will stay with me even longer. In love with our kids. The two and a half weeks were spent all together with very few times where we split up. We played games, shared books, rode public transport all smooshed into too tiny spaces, hiked, made jokes, looked at world class art, were bored by too many churches from the 10th century, ate gelatto like there was only one scoop left, compared American pizza to Italian and voted for American, we snuggled and hugged, took photographs, danced in endless combinations of relatives, walked and talked, and played chess and cards. The vacation was one long family love fest. I am humbled. I wanted to bring my children to the world. Instead, the world brought them closer to me. Jon and I were in awe of how well they get along, how much fun we all can have together. It is the unexpected end result and it is why I’m in tears at this early jet-lagged hour. I will miss my family, even as we live in the same house. That intensity of being that comes from shared travel, the togetherness of tiny apartment dwelling and the absence of TV, X box, five computers and the daily grind of work and school schedules cooperated to make our family time the high note of this trip. 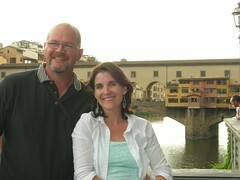 Certainly, gelatto, ancient archways, Medieval towns, olive groves, the David, and Italian blue skies helped. Oh and we spent a lot of money. That helped too. 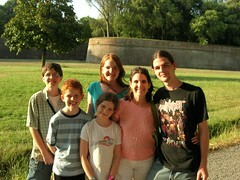 But like the Mastercard commercials say: family time on vacation in Italy–priceless. I’ll share more soon with photos and reflections on specific parts of the trip. For now, I’m savoring the memory of being especially close to the six people I love more than anyone on earth.